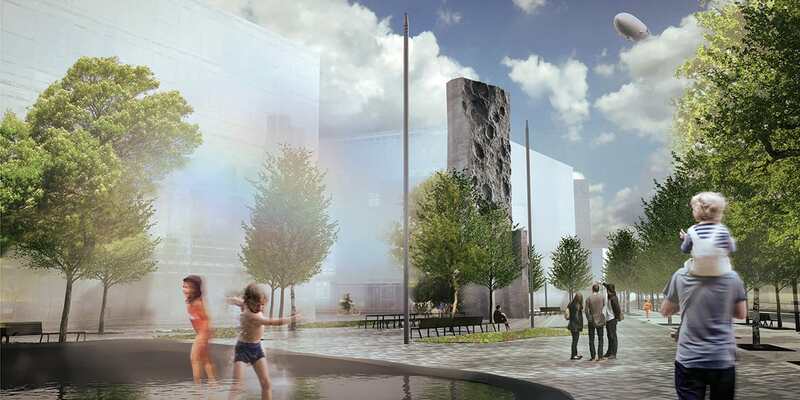 The city’s Bureau d’art public, in collaboration with the city’s Service de l&apos;urbanisme et de la mobilité, held a competition for a work of art for the MIL Montréal central square (the Outremont site and its surroundings). The jury selected a proposal by artist Patrick Bernatchez for a work whose temporary title is 29 • 53. Four proposals were chosen from 57 applications that were submitted. The work 29 • 53 was chosen unanimously by all jury members. The work will be central to the public square of the MIL Montréal project, whose aim is to redevelop the former Outremont switching yard and repurpose the surrounding area. The MIL Montréal project includes the new Université de Montréal science campus (the MIL campus). With its monumental size and location at the intersection of main streets running through the new neighbourhood, the work will be an urban landmark that reflects both the huge size of the site and the square’s human scale. As the first of three works of art in the area, its emblematic character will help to promote new public sites and the built heritage that surrounds them. 29 • 53 refers to the average duration of a lunation (the period between two new moons), which is 29.53 days. The 21-foot-high work has two sides. One side is a precise reproduction of a portion of the surface of the Moon. The other symbolizes the dark side of the Moon and features a climbing wall. Both sides, in their own ways, are evocative of the conquest of territory and are inspired by the site’s past vocation as a railroad hub. The work, which will be installed over the summer of 2019, also commemorates the 50th anniversary of the first step on the Moon. The installation, which will be centrally located on the public square, will help to foster a sense of belonging for residents. To this end, the 17 articles of the U.N. Outer Space Treaty (ratified on January 27, 1967) will be inscribed on the work’s base. The treaty defined extra-atmospheric space, including the Moon, as a collective and peaceful space of cooperation and mutual assistance. Through this innovative project, the city is supporting public art research and innovation and reiterating its commitment to improving Montrealers’ quality of life, ensuring sustainable and economic development and the city’s international stature. Integrating public art into development improves a site’s quality and makes works like 29 • 53 distinctive and identity-building elements of the Montréal landscape. Over the past decade, Patrick Bernatchez’s artistic practice has explored the subjects of death and time, which are fundamental pillars of his work. His multidisciplinary practice includes drawing, engraving, painting, photography, film, installation, music and sound. His work has been featured in major exhibitions at the Luxembourg Casino, the Montréal Museum of Modern Art, the Toronto Power Plant and the Media Art Center in Brussels.